The 2018 FIFA World Cup starts tomorrow, and there are some notable absences from the program outside of the U.S. Men’s National Team. The World Anti-Doping Agency (WADA) has officially removed the marijuana derivative cannabidiol, usually sold as CBD oil, from the banned substance list, making this the first World Cup in which any substance even remotely weed-related is allowed on the field. Given the push towards the legalization of medical marijuana, other cannabis derivatives, like CBD oil, have intrigued researchers and players alike. You can’t get high off of CBD, unlike the more popular psychoactive cannabinoid THC, and preliminary research has shown that it’s effective in treating some forms of epilepsy, psychosis, and even chronic pain. The world of professional sports has been hesitant in its approach to CBD, however, because of its link to THC, which is still heavily stigmatized. THC and CBD are closely related but chemically distinct, and the burden is now on WADA’s drug testers to distinguish between them before they go handing out bans. “I would imagine CBD is metabolised in the same fashion as THC. CBD is similar overall in picture,” Ted W. Simon, Ph.D., adjunct professor of environmental health science at the University of Georgia, tells Inverse. From his perspective, there isn’t much room for error in World Cup drug testing because the metabolic markers that come from processing the chemicals in the liver and kidneys should be sufficient to distinguish the two. “You could discriminate between them,” he adds, after reviewing a 2013 paper on the subject. 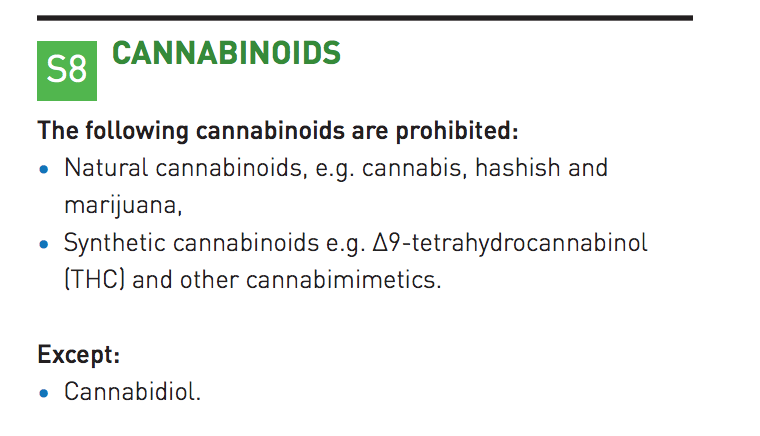 An excerpt from WADA's prohibited substance list. CBD is the only exception to a blanket ban on Cannabinoids. Not all regulators see as clear-cut a chemical distinction as Simon, which is why regulating CBD has been difficult. They are derived from the same plants, and they almost share the exact same molecular formula: The only difference is that CBD has one extra hydroxyl group attached to it. That single hydroxyl group is all that stands between a psychoactive compound and what research suggests is legitimate anti-inflammatory, and it makes all the difference. THC is still on WADA’s banned substance list, so any trace of THC is enough to get you banned from international competition. Since then, companies like Sana Sana Wellness have developed CBD oil for sale, marketing its potential medicinal properties. Tennessee Titans Linebacker Derrick Morgan, fearing the increasingly documented degenerative effects of CTE, used CBD oil as an anti-inflammatory to help soothe the effects of repeated blows to the head. “For me it was the neuro-protectant qualities of it,” he said in an interview with CBS. Professional sports leagues, however, are not easily persuaded. CBD is still banned in the NFL, MLB and other US-based sports leagues, and so far, no World Cup player has come forward announcing their plans to use CBD oil. WADA, for its part, has taken a major step in changing the attitude surrounding cannabidiol. Golfer set to launch CBD-infused product line. The election night in the USA became a victory moment for marijuana legalization supporters in some American states. Voters from Maine, Nevada, Massachusetts, and California said “yes” to the recreational use of cannabis.